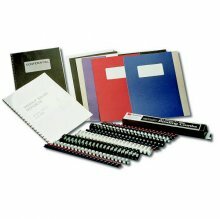 Comb binding offers total flexibility, allowing you to create professional presentations from 2 to 425 pages. High Quality A4 21 loop plastic combs / coils for use with all standard binding machines. Combs can be reopened to insert or remove pages at any time. 6mm comb - 25 sheets capacity. 8mm comb - 45 sheets capacity. 9.5mm comb - 65 sheets capacity. 12.5mm comb - 95 sheets capacity. 16mm comb - 145 sheets capacity. 20mm comb - 165 sheets capacity. 25mm comb - 225 sheets capacity. 38mm comb - 330 sheets capacity. 50mm comb - 450 sheets capacity.